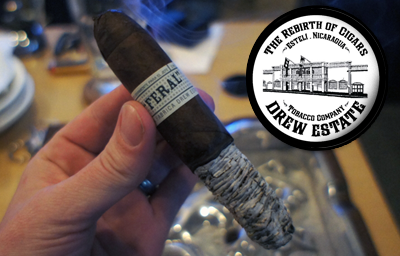 Today's cigar for review is the next installment from Drew Estate in the Flying Pig line. 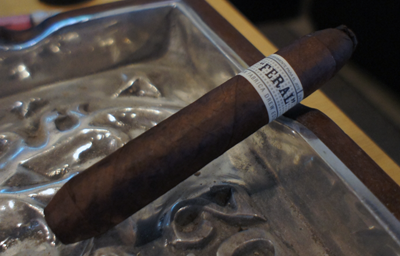 The Feral Flying Pig is a departure in size from the previous two pig releases (the Flying Pig #9 and the Flying Pig T52) and is quite a bit bigger. As well as the size being different, Jonathan Drew has posted online that it is a completely different blend than the other releases and that it is significantly stronger. Steve Saka (President of Of Drew Estate) has also been quoted saying this is the best Flying Pig release yet. 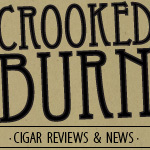 Video - Interview: Jonathan Drew, My Uzi Weighs A Ton - Burning Leaf, Chicago Illinois - Cigar Explorer from Cigar Explorer on Vimeo. 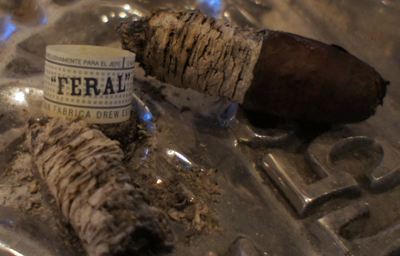 First off, I want to say that the Feral Pig was a hefty cigar to hold in my hand. Not that the length or ring gauge felt overly beefy, but the weight was significant. There was a lot of thick tobacco rolled into this and I could tell. The wrapper was a very dark brown almost black coffee color with a few small veins, but nothing too ugly. For broadleaf, I'd say it was a pretty good looking leaf. The cigar feels expertly rolled and was finished off with the signature pig tail cap. The pre-lit aroma had what I would now consider the classic Liga Privada smell, consisting of a lot of sweetness, mixed in with floral notes. The cold draw was nice and free (more on that in a second) and tasted raw sweetness and orange peel. I mention the draw again because what I find very interesting and distinct about these sticks is you don't actually have to clip them to get a draw. You just tear the pig tail off the head of the cigar and you're good to go. That simple removal of the pigtail creates the prefect amount of air flow to get full puffs of smoke out of it. Nice fun feature. Lighting up this stick was very simple and the first few puffs on my Feral Flying Pig created a lot of flavors. On the front I tasted and felt a peppery warm spice coat parts of my palate as well as some espresso bitter bite. The finish of each puffs had tons of floral flavors and, even more noticeably, out the nose. At this point in the cigar, I'd say this was easily as complex as anything I have had in the Liga Privada line. The cigar put off a ton of resting smoke and burned at a very slow pace. The construction was excellent and even though the burn was a little wavy, I did not have to touch it up with my lighter. The strength was in the upper medium to lower full range. The second third of my Feral Flying Pig really really ramped up in strength. Just a few puffs into this part of my cigar I could already start to feel my heart beat pick up and my head get a little dizzy. I slowed my smoking rate down and that took care of any woozy feelings. During this part, the flavors seemed to back off a bit and most of the peppery spice and floral notes had died away. The main flavor now both on the front and the finish was the bitter espresso from the first third. I say bitter, but it was a nice bitter and not a bad flavor. It's also worth mentioning that the finish was very dry and left my mouth feeling dry but not dirty. Again the construction was excellent and the burn had no issues. The ash was also something worth noting because, as you can see in the photos, it held on all the way to the final third. 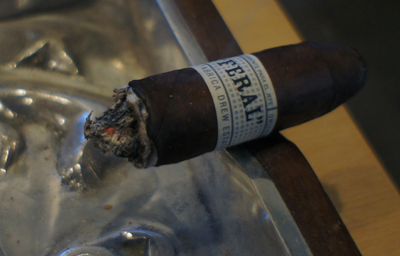 Getting to the end of my Feral Flying Pig saw some of that complexity from the first third start to pick up again. I started getting more spice on the front of each puff, which created a more balanced flavor with the espresso. I was really enjoying this stick again at this point, but I was also only drawing on the stick maybe once every five minutes. By this time my body was full up with nicotine and, while it wasn't overly uncomfortable or sickening in anyway, I knew not to push my limits. I smoked it to the nub and it never got hot or had any burn issues. 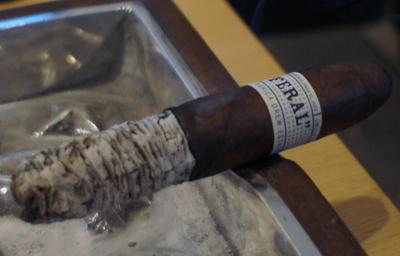 My final thoughts on the Liga Privada Unico Serie Feral Flying Pig? This cigar delivers exactly what is advertised when it comes to strength. This is not one for the light weights or even the medium strength smokers. I think it's the strongest thing I've ever had from Drew Estate. The the complexity of the first third was very impressive and the fact that it started to return at the end made for a very enjoyable start and finish to the smoking experience. I do think the cigar fell a little flat in the middle of the stick, but maybe with a bit of time that will change. Does it take the place of the Dirty Rat as my favorite Drew Estate cigar? No and it's a completely different type of cigar...but I would say it's now second on the list for me. Would I buy it again? If I can find more I will pick some up. Would I buy a box? I'd be up for a split with someone. Thanks for the review Dan. I finally got my hands on a couple of these and I'm looking forward to smoking one. I also have had the Dirty Rat, Papas fritas and I own but have not smoked the L40. But these pigs look like something special.